Richard Garrett & Sons was a company which manufactured of all kinds of agricultural implements and machinery. The firm was particularly well known in the nineteenth and early twentieth century for its steam engines, large numbers of which were exported to all corners of the world. Their factory was Leiston Works, in Leiston, Suffolk, England. The company was founded by the first Richard Garrett in 1778 and was active under the Garrett family ownership until 1932, when it went into receivership and was bought by Beyer Peacock of Manchester. In the late 1840s, after building up a successful agricultural machine and implement business, the company began producing portable steam engines. The company grew to become a major business employing around 2,500 people. Richard Garrett III, grandson of the company’s founder, transformed the works from a large smithy into an internationally known factory and was an early member of the Royal Agricultural Society of England. He was a guarantor of the Great Exhibition of 1851 in London, where Garretts had a prominent and well stocked stand. Here, during a meeting with Samuel Colt, the American gunmaker, he learnt the value of flow line production. 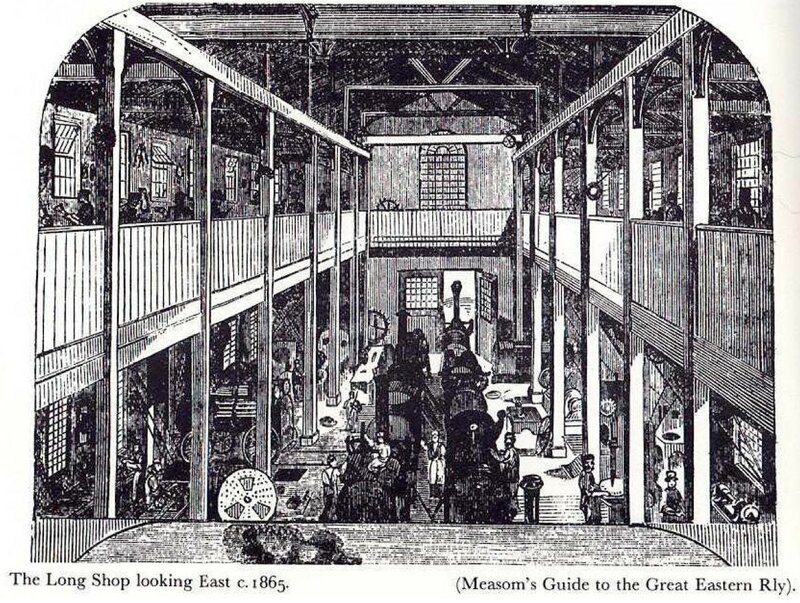 Returning to Leiston he immediately set about building the Long Shop (so called because it was a workshop of considerable length), the first building to house such an assembly line for the mass production of portable steam engines. 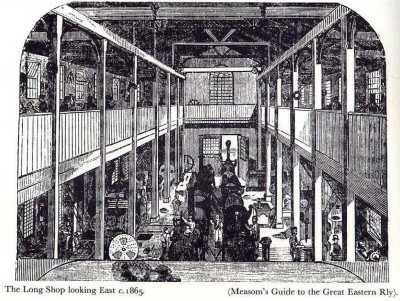 A machine would start at one end of the Long Shop and as it progressed through the building it would stop at various stages where new parts would be added. There was also an upper level where other parts were made; they would be lowered over a balcony and then fixed onto the machine on the ground level. When the machine reached the end of the shop, it would be complete. Although other products, particularly seed drills, continued to be made, the threshing machine and the portable steam engine, followed by the traction engine and road building machines, were the dominant product in the second half of the 19th century. As well as providing employment, Garretts had considerable influence on the town and the area, establishing their own gas works and supplying the town with water from the Works well until a public supply was put in just before the First World War. Houses were built for the workmen at the company’s expense and a handsome contribution was made to the rebuilding of the parish church in 1853. A Mechanics Institute was equipped with reading room, library and a dining room where the workmen could eat their own food and a Mutual Benefit Society was set up to protect men against the hazards of sickness and accident. Under the somewhat autocratic rule of Frank Garrett Senior, supported by his three older sons, the Company flourished until the early years of the 20th century when the men came under the influence of the trades union movement much to the displeasure of the management. In 1912 trouble flared up when clashes between the workforce and management were exacerbated by a national coal strike which affected deliveries to the factory and Frank Garrett Junior imposed a lock out, only re-employing non union men. A year later a serious fire broke out in the thresher department causing considerable damage. As a result it was decided to build on land owned by the company as a demonstration farm near the railway station and to move all the woodworking activities to the new factory, known as the Top Works. The First World War brought disaster for the company; when war broke out in 1914 the work force was depleted of key German personnel, and a large number of Leiston men went to France with the 4th Batallion of the Suffolk Regiment, a Territorial batallion under the command of Lt. Col. Frank Garrett. The battalion suffered a large number of casualties of Leiston men and Col. Garrett was invalided home. Captain Stephen Garrett who would have wisely persuaded the company to introduce the internal combustion engine was killed at Neuve Chapelle. At home it was decided to halt the production of agricultural machinery and concentrate on vehicles and munitions for the army, including light aeroplanes, on which women were employed for the first time. After the war financial difficulties were exacerbated by the fact that, following the revolution of 1917, machinery exported to Russia was never paid for, resulting in a huge unpaid debt. It was felt that the best way forward was to join with other companies to form a combine known as the Agricultural and General Engineers Ltd. (AGE). This was not a successful move and resulted in Garretts going into receivership in 1932 . 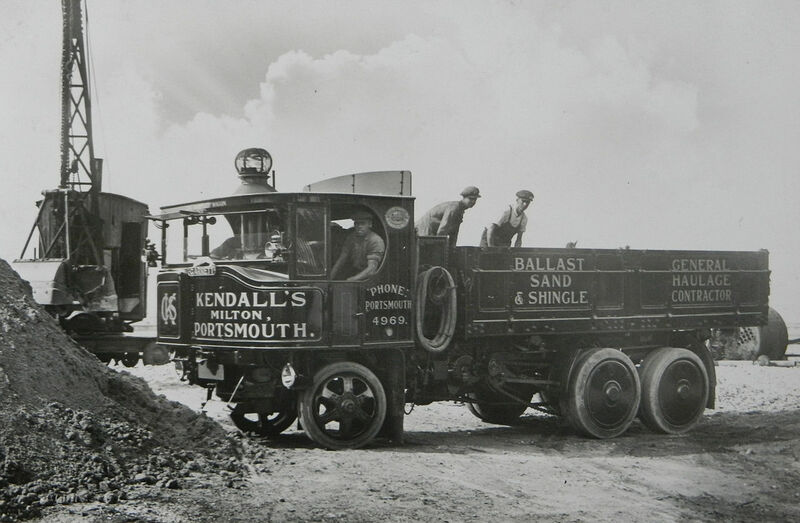 The company was purchased by Beyer Peacock of Manchester and the business continued as Richard Garrett Engineering Works Ltd., making a wide range of products . The Works finally closed in 1980 following some changes in ownership after the Beyer Peacock group was sold in 1976. 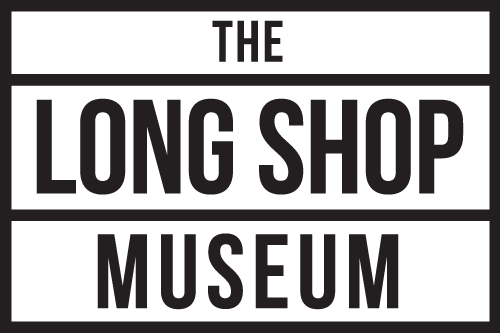 Today, part of the old “Town Works” site is preserved as the Long Shop Museum. Some of the offices are used for private dwellings, but the rest of that site has been demolished and the land used for housing. Part of the “TopWorks” site is used for industrial units while the offices, known as Colonial House, have been enlarged and converted into flats.